Mobile phones are ubiquitous in India, a necessary requirement to carry out everyday tasks such as banking and identity verification. There is a flip side to this convenience. 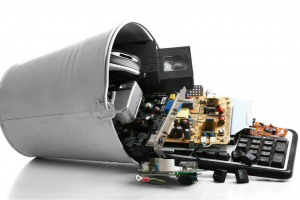 Disposing e-waste (electronic and electrical items) is a complex challenge as it contains heavy metals and other toxic substances. In India, it’s been largely confined to the informal sector which does not have the skills or resources to deal with this challenge. This translates into serious environmental damage, especially in cities like Moradabad which handle a disproportionate share of e-waste. Not only is the e-waste generated domestically not receiving adequate attention, field research indicates that e-waste from more affluent countries is also being imported into India for disposal. This problem needs urgent attention at all levels of government as the eventual price will be paid in terms of deteriorating health. The economic summit at Davos has flagged the problem too. A set of UN entities put the matter in perspective there, by observing that the world generates 50 million tonnes of e-waste a year, which exceeds by weight all commercial airliners ever made. In India one estimate is that the country has a capacity to dismantle and recycle only 20% of its total e-waste. There is a regulatory framework to deal with safe disposal of e-waste but its impact has been limited. For instance, the legal responsibility on smartphone manufacturers to help in waste management hardly works in practice. This perhaps explains why the informal sector handles most of the e-waste. Given the link between human health and e-waste disposal there is an urgent case for government to regulate an effective upgrade of the recycling ecosystem. It will save healthcare costs and improve quality of life. On Friday this Modi government will present its last budget. Thus far the government has presented five budgets, a sufficient number to identify an important feature. This happens to be a common thread running through UPA and NDA governments: understated fiscal deficits. The Comptroller and Auditor General’s reports have pointed out that the budget understates fiscal deficits by exploiting accounting loopholes. Consequently, the credibility of budget numbers has been undermined. It is not just fiscal consolidation which matters. The manner in which targets are achieved is also important. Governments in India follow the cash accounting system. Expenditure in this accounting system is recognised only when cash flows out of government coffers. A consequence is that deficits can be understated by delaying payments. To illustrate, in 2016-17, budget documents said subsidies as a proportion of GDP were 1.53%. According to CAG, it should have been 2.21% as claims of about Rs 1.03 lakh crore by public sector companies had not been paid. A little over 14 years ago, the 12th Finance Commission observed that the current cash accounting system provided room for “fiscal opportunism” and called for a transition to the superior accrual system of accounting. The transition is yet to take place. Emphasis on accounting systems and quality of fiscal consolidation is not a case of nitpicking. Greece’s problems over the last decade should serve as a warning. The country kept understating its budget deficit. Finally, in 2009, Greece was plunged into a debt crisis after a new government came clean on the actual number which was almost three times more. Misreporting has indeed had long-term consequences for Greek economy and society. Conventionally, a government’s last budget is one which refrains from initiating major expenditure commitments. A new government will present a full-fledged budget within a few weeks of taking office and it’s only fair that it’s not burdened with a significant new expenditure commitment. Such a commitment constrains budgetary space for a new government. This reason also holds good for the larger problem of exploiting accounting loopholes. Even if expenditure is pushed off the government balance sheet it has to be paid for. There’s no free lunch for an economy. An opaque approach only creates additional problems. For too long, governments have been casual about the transition to an accrual-based accounting system. This should not be put off any longer as transparency is in India’s best interest. The political crisis in Venezuela took a dangerous turn when Juan Guaidó, the new head of the National Assembly, declared himself “acting President”, challenging the authority of President Nicolás Maduro. Soon after Mr. Guaidó’s announcement, the U.S., Canada, Brazil and a host of other Latin American countries recognised the 35-year-old leader from the Popular Will party as interim President. A furious Mr. Maduro cut diplomatic ties with the U.S. and ordered American diplomats to leave in 72 hours. Venezuela has grappled with an economic and political crisis of its own making for almost two years now. When oil prices started falling from its 2014 highs, it badly hit an economy that was over-reliant on petroleum exports and was borrowing heavily to fund its over-spending on social welfare programmes, which former President Hugo Chávez liked to describe as a “Bolivarian revolution”. Mr. Maduro’s government was clueless when the economy started collapsing. At least 90% of the people now live below the poverty line, inflation is forecast to touch 10 million per cent this year, food and medicine shortages are widespread, and the economic woes have triggered a massive migrant crisis — nearly three million are estimated to have fled the country in recent years.The opposition, whose attempts to overthrow the Socialists, including the 2002 coup against Chávez, had failed in the past, launched protests against Mr. Maduro. The government used brute force to suppress them, while the economic situation deteriorated. This left Venezuela in a constant state of economic hardships and violent street protests over the past two years. The main opposition boycotted last year’s presidential election, which Mr. Maduro won with 67.8% vote. Mr. Guaidó’s claim is that the election was not free and fair and therefore Mr. Maduro is not the legitimate President — a claim that the U.S. and its allies back. 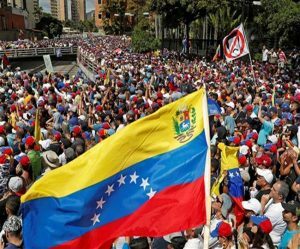 While Mr. Maduro shares a lot of the blame for the mismanagement of the economy, forcibly removing him from power with support from foreign nations may destabilise the country further, even leaving aside the legality of such a move. Mr. Guaidó may have hoped that by anointing himself a rebel President with backing from the U.S., he could win the support of sections of the armed forces, without which he cannot unseat Mr. Maduro. But that plan appears to have failed with the military declaring its loyalty to President Maduro. To be sure, the people of Venezuela deserve a better deal from a government that has led them to untold suffering and forced millions to flee the country. Destabilisation by interfering in the political process is not the solution, however. What is required is a coordinated international effort to restore some degree of economic and political normalcy. In the long run, it is up to the people of Venezuela to decide their own political destiny. A dead SAARC must be revived to decide what its three members are going to do after the Americans leave Afghanistan. The Ashraf Ghani government will not survive after the American-funded Afghan army disintegrates and joins up with the Taliban. That’s why the Taliban are refusing to even recognise the Kabul government: The Afghan army is the low-hanging fruit that will enlarge their capacity to challenge both Pakistan and India. It is difficult to diagnose the state of the mind of decision-makers in Pakistan. But their decision to turn to India and offer “talks” and “trade” points to the possibility of the kind of “normalisation” needed for handling the next crisis in Afghanistan.